What Can Be Put on a Cracked Glass Window to Hide or Blend the Crack? It can start small and spread long and wide. A divot or ding in a car or home window can spread into long weaves of increasingly dangerous cracks on the glass. Home window glass or windshield repair can be done with the correct tools and a little patience. 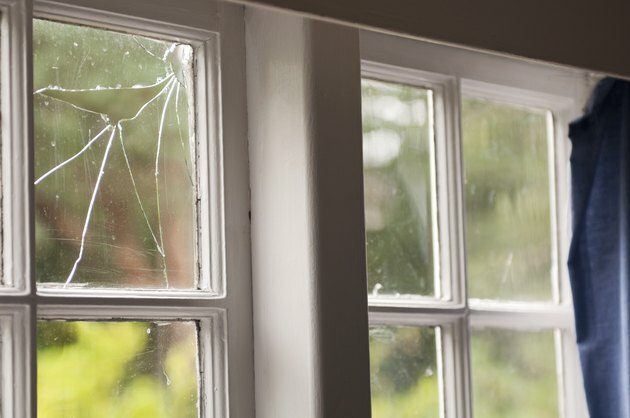 Getting to a crack before it travels across the entire pane will give you a better chance of saving the window and not have to undergo an expensive repair to a cracked glass window. Over time, glass is going to get some hard work thrown at its glistening surface from weather and errant objects that fly through the sky, from bugs to baseballs. When a chip or crack appears on a windshield or window, it can feel like a big problem for such a minuscule impurity in the otherwise pristine surface of the glass. The deeper a chip is on a window, the faster it will create cracks that emanate from its faulty center. Cracks can start at just a quarter of an inch or show up as big as two inches before they need to be taken care of quickly. You can repair a cracked glass window yourself if the crack hasn't traveled from one end of the frame to the other. First, dab the area carefully with a cloth dipped in rubbing alcohol to remove any dust, debris or impurities from the glass. Home repair includes using hairspray to cover and control a small chip from spreading. A recipe of a half cup of water, a tablespoon of salt, a tablespoon of commercial bug spray and a tablespoon of rubbing alcohol can be used to clean and stop a crack or chip from traveling across a window until it can be repaired professionally if needed. There are also many commercial window repair kits available online. If a car window has been shattered, it needs to be covered immediately to keep out weather, insects, animals and would-be thieves looking for an easy target. The best way to cover a broken car window is with a heavy or durable material depending on how long it will take until the window can be professionally replaced or repaired. First, remove all bits of glass from the frame. Put a towel down in the area where the glass will naturally fall once you begin to remove the shattered and sharp bits. Once the glass is removed, vacuum up the frame and the seats or surrounding area to ensure space is safe. Wipe down the window frame and seal to make a clean surface that tape or whatever adhesive you intend to use will stick to the area. Use canvas bags, cardboard or other durable material that can cover the entire space. Thin plastic bags won't last a drive to the corner store much less a speedy stint on the freeway. What Can I Put on a Window to Stop the Crack From Spreading?